Home / Archive / Could more channels make the free-to-air switch? Could more channels make the free-to-air switch? The recent additions of PBS America, Really, Drama and Yesterday on Freesat may just be the start of a trend of niche channels ditching encryption and going free-to-air on satellite. On Tuesday, UKTV's Really, Yesterday and Drama joined Freesat in a move that's been top or near the top of Freesat viewer's wishlists for years. 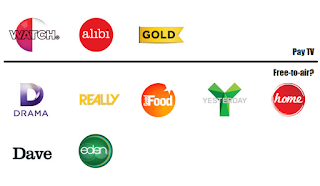 Now Enders Analysis has released a report which suggests it's a possibility that UKTV-owned channels such as Eden, Good Food and Home might go free-to-air in the future, especially if Sky thinks these channels won't add much to their subscriber base. 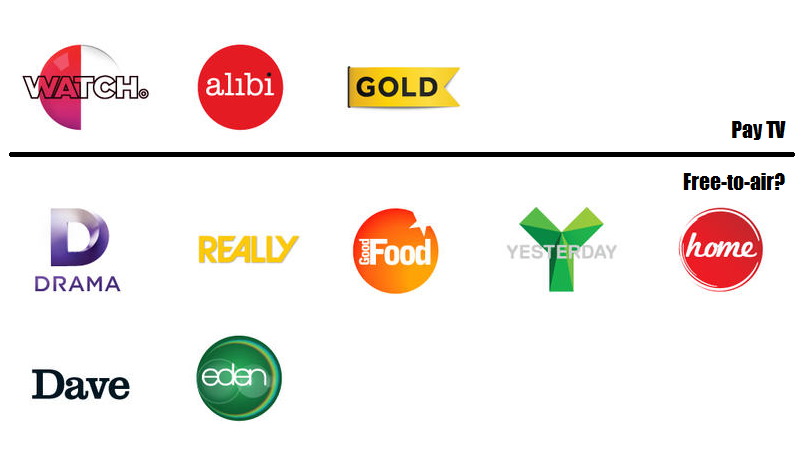 But the Enders report says sister channels Gold, Alibi and Watch will continue to drive pay TV subscriptions, so will still be of value to Sky in any future carriage deals. It's the latest rumbling in the media industry which has seen pay TV carriage deals flatline or reduce in value, especially as Sky focuses on attracting premium brands and content and moving away from locking almost every niche channel behind a paywall. So what's changed and why might more channels be thinking about making the switch to free-to-air? In the early days of digital TV, Sky was willing to agree carriage contracts with all sorts of channels as it sought to become the biggest provider of multi-channel TV with the biggest choice of channels: regardless of whether they were premium, mainstream or niche channels. Then came Freeview. Fuelled by a rapid take-up of set-top-boxes, Freeview's audiences grew rapidly in the mid-00s. And some channels realised that they could make more money from advertising to larger audiences by joining Freeview, more than outweighing the cost of Freeview bandwidth and losing pay TV revenue. And so the first wave of free-to-air switches occurred, bringing channels such as E4 and Film4 to the masses. New channels from ITV, UKTV and Channel 5 launched straight onto Freeview grabbing an early foothold on to the free-to-air platform. Then came the internet. It enabled new providers such as BT to set up rival pay TV platforms to Sky and new media companies to offer low cost access to movies and other popular content with no long-term contracts. Niche or foreign language services could target audiences directly and reach them without the overheads of satellite transmission. Sky was no longer the primary way of getting the full range of channels or content that viewers wanted to watch. Then came changes to the satellites used for Sky's service. This year, a programme to replace all old satellites serving UK audiences was completed. The new satellites enable broadcasters to choose more freely between broadcasting on a beam covering all of Europe, or a beam focused on the UK and Ireland. Originally, channels who wanted to broadcast on satellite, but didn't want the cost of securing broadcast rights clearance for all of Europe had to take up Sky's encryption services: early satellites were designed to blanket vast areas with their signals. Then UK spotbeam capacity gradually became available: initially only enough to serve the main UK channels. During the past two years, the launch of new satellites means it's now more widely possible to switch to a UK spotbeam. That's what UKTV have just done, enabling them to bring Really, Yesterday and Drama to Freesat. Now, providing a broadcaster is able to secure rights clearance for the UK, Ireland and the low countries, which the UK spotbeam overlaps across, they can opt for free-to-air transmission, sidestepping the need to encrypt with Sky. All of these technical changes are compounded by strong competition in the pay TV market for premium sports, drama and movie rights. As such, pay TV operators such as Sky are focusing more of their resources on securing and maintaining rights and providing a core premium channel offering with greater emphasis on original productions. In addition, resources are going on services with a higher picture quality and on the hardware used by viewers to watch and manage what they watch, to offer something a little more special than is available on the standard PVRs, smart TV boxes and dongles freely available today. In essence quality over quantity. It means there's less incentive to offer lucrative pay TV carriage deals to channels with low viewing figures, little original content or low-value imported programming, often repeated, looped and shown back-to-back for hours at a time. And it means there's a good chance that further channels will make the switch to free-to-air soon, providing the affected channels calculate they can make more from advertising to a larger audience than from a flatlining or reducing amount of pay TV revenue, whether or not it happens to be Eden, Good Food or Home or another channel from another media group altogether. Of course, any channel that does make a move to free-to-air platforms instantly devalues the content on Sky's competitor services, such as BT TV and Virgin Media (viewers may wonder why they are paying for access to a channel when it's available freely elsewhere), which is why it's hardly surprising to see these competitors shoring up their offerings through premium content and partnerships with internet services such as Netflix. How has the free-to-air trend progressed? In 2013, several satellite music channels suddenly went free-to-air, signalling an end to niche channels automatically being behind a paywall. Since then, new channels such as Spike, TruTV and YourTV have launched as free-to-air services, in contrast to the likes of TLC (which launched in 2013) and earlier entertainment channel launches which went straight to pay TV on satellite. In October 2015, PBS America lifted its encryption and went free-to-air, starting the current process of free-to-air migration. Will that bring more services to Freeview? Freeview itself is nearing being full to capacity. The last few years has seen existing free-to-air satellite services such as CBS Action and Travel Channel snapping up bandwidth on the platform to expand their presence, meaning there's little room for current pay TV channels to make the switch and move to Freeview - at least not until changes to the Freeview service are made towards the end of the decade, changes are highly likely to see broadcasters adopt a more efficient technological standard of broadcasting across all multiplexes. As is currently the case with the likes of PBS America, True Movies and The Box, it could be that Freesat is initially the main beneficiary of any further free-to-air changes. But anyone hoping we might see more free-to-air content in HD might be disappointed: Channels are more likely to encrypt their HD offerings, due to the increased expense of broadcasting in HD. While 10 standard definition channels per satellite transponder is easily possible, just five HD channels may be possible on each transponder. Additionally, Sky and other pay TV platforms will continue to tempt HD channels to remain part of their subscription service, as long as the improved picture quality of HD continues to be a factor customers consider when choosing a TV service and customers are willing to pay the premium. Whatever happens, it's certainly the case that many viewers will initially welcome the choice of more free-to-air channels. But if the content is mediocre, that welcome might be shortlived. Faced with hundreds of bland free-to-air channels, a smaller selection of premium content pay TV channels, with full on-demand catch-up capability might be more interesting. Whilst HD and 4K quality may be attractive, programme content is far more important. An old low definition 'classic' even in black and white is far more attractive to most viewers than yet another reality, churned out soap or average drama in super dooper hidef! This certainly makes sense as Freesat basically hosts the most popular FTA channels that viewers actually watch. The profile of each channel must be higher because the EPG is not littered with hundreds of meaningless dross channels. I must admit there have been times when I have watched some channels on the Sky EPG and wondered if I'm the only person in Britain watching! Oddly enough I actually work in TV production; so I am possibly more aware than most of where the pressure points are. I paid for subscription TV once... In the 90s... It was complete and utter rubbish! And I never renewed my annual subscription. Decades on and I've seen nothing 'escape from captivity' (not even though the trade) that I would have paid to see; yet do watch many of these FTA channels - and of course see the advertising! I suspect there is a silent majority out there to whom Sky, Netflix, Amazon et al are just 'cages' that render content unavailable. The question for broadcasters is; do you want your programmes seen or not? If not; encrypt!